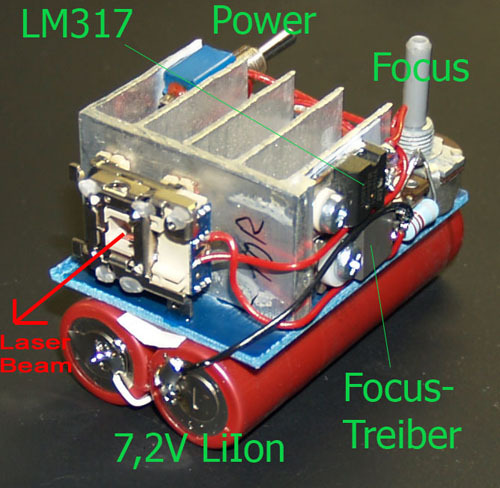 Laser Diodes are no toys! Do not point them anywhere, where people or animals could look into the beam or reflected laser light could meet their eyes! This article is only of informative purpose to show the possibilities offered by "state-of-the-art" light sources like lasers. You have only two eyes so be kind to them! Another "problem" with my E-330 is shooting sharp pictures at night. Due to its construction feature called "live view" (this means you see what you shoot in real-time on the display as with compact cameras), 50% of the incoming light go to the additional CCD doing auto focus and metering while the other 50% go to the viewfinder you can look through, which results in decreased sensitivity during focusing. On the other hand, when there is no light, there's no way to focus either, whatever kind of construction you use! At the beginning I used to take a flashlight with me, but most of them aren't suitable if you want to illuminate something a hundred meters away. So I needed a light source which could be collimated very well for throwing a light dot only a few meters in diameter over far distances. What would be better for this job than a laser? These were 16x recorders with a 200mW Laser Diode inside which emits bright, red light. A good protection is to place a fast capacitor (e.g. ceramic SMD type) with approx. 100nF directly between the connection legs of the LD. You shouldn't use these diodes without an adequate heatsink, too! Heating results in degradation, which can shorten the lifetime of your diode to a few hours! 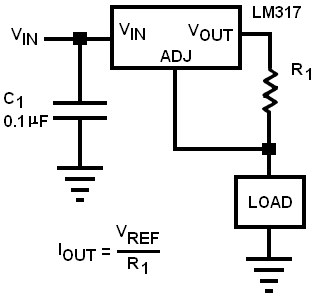 For current regulation I decided to use a LM317 because it's cheap and the 1 Ampere limit is more than enough. The LM317 must be mounted on a heat sink !!!! Overheating may result in no more current limiting, thus damaging your LD !! The output current is independent from supply voltage; the only demand on Vin is that it must be about 2 Volts higher than the LD voltage, so you need about 5 Volts for Ub. Two LiIon cells are a great power supply; unfortunately one isn't enough. For focusing (thus changing the diameter of the light spot in different distances) I've built the lens from the DVD recorder Pickup in front of the Laser Diode. 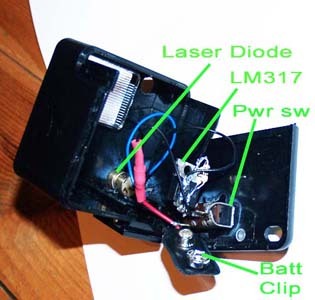 By adjusting the current through the Pickup coil, the lens moves for- and backward. To adjust the current I've jused a simple emitter follower transistor whose base current is adjustable with a potentiometer. I have no schematic for this cause it's built from parts out of my junk box and it was a "quick-and-dirty"-project; there's no PCB for this project neither! 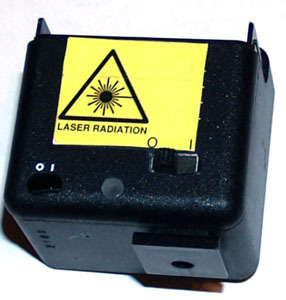 For portable use I've built another laser which is powered by a 9V block battery and installed in the housing of an old flash; this has a permanent place in my photo bag. 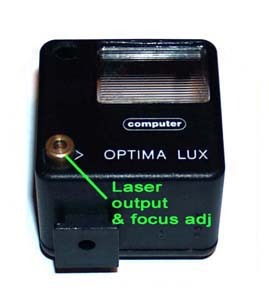 Its focus is adjustable by turning the lens mount (mechanical adjust, no electric one); the output power is fixed to 100mW with a LM317. Due to the short power-on-time I've omitted the heat sink. 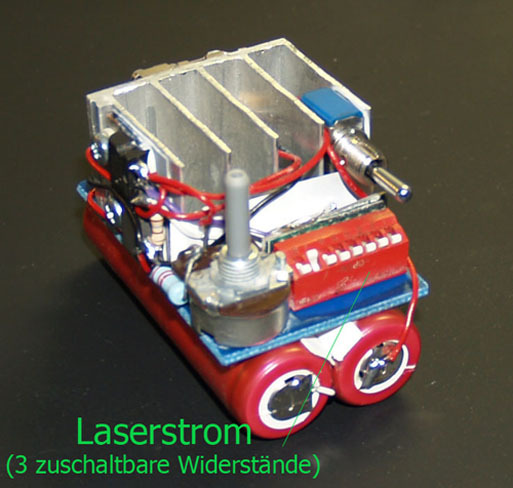 The laser diode is cooled by the brass tube (part of the lens mount; only for short power on times! ).